Recently I’ve been itching to go to a beer dinner, a really delicious excuse to eat too much delicious food and drink too much delicious beer, but to be honest, they’re just too expensive. I mean $50 for a four-course meal with 4 beers is pretty reasonable, assuming that each of those beers costs $5, that’s $20 and then the dinner itself is $30. However the reason person within me thinks ‘wow, when was the last time you spent $50 just on food for yourself in a normal restaurant situation?’ I feel like beer dinners should just be cheaper – you’re a captive audience and supporter and blowing $100 on a weeknight meal for two just feels frivolous to do more than once a year. It’s ok to make it expensive sometimes especially if you’re involving a renowned chef, but to really get people excited and learning about craft beer and food/beer pairings, you have to make it more accessible – lower the cost. However, it’s a two-fold situation. Beer-pairing dinners are the little brother to wine-pairing dinners, which are arguably more expensive and, for lack of a better word, ritzy. The discourse around wine is much more sophisticated and as are the people that talk about the ‘bouquet of the wine’ and nibble crackers in between tastings (that apparently you are not supposed to actually swallow). Wine is supposed to go with high-class food while beer goes with sporting games and burgers. But as we’ve seen recently ‘everyday’ food like burgers and grilled cheeses are become more popular, more ritzy, and definitely more expensive. So why not pair beer with those things instead of the unattainable Michelin star-type food you find matched up with wine? Well, some do, but then they charge wine dinner prices for it. Sure good quality craft beer isn’t cheap, but it’s definitely not fancy pants wine and that’s not what beer is all about so why charge like it is? 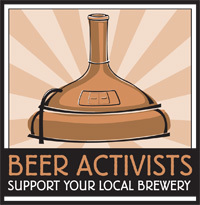 Beer is for the people, even craft beer, believe it or not. If craft beer is expensive then won’t people think it’s better and more elite, like wine? So then it practically needs to have events similar to those with wine. Craft beer no longer competes against crappy American lagers, it competes against wine. I’ve said it before and I’ll say it again, people who say they don’t like beer just haven’t found the right one. There is a larger variety of flavor profiles in beer than there is in wine because it can literally be or taste like anything – craft brewers are getting adventurous and by over-pricing beer dinners, people are missing out. Pairing craft beer with gourmet food isn’t the ‘next big thing’ because it’s here and frankly it’s unsustainable and further alienates people that craft beer has left behind. The future of craft beer and food is high-low beer pairings, bringing the people and the beer together rather than the beer to the people. Last summer for a friend’s birthday we went to the Lagunitas and Heggie’s pizza beer-pairing dinner at the Nomad World Pub. It was awesome. For $20 we had four (five?) glasses of Lagunitas paired with five different slices of the famous bar-only Heggie’s frozen pizza. As an appetizer we had a handful of Totino’s pizza rolls in a whiskey glass served with a tasting glass of beer and then from there, the beer and pizza were flowing. Before every new pizza and beer, the local Lagunitas rep gave us a brief description of both and why they went well together – there were no white tablecloths, no cloth napkins for that matter, just a lot of beautiful patio and tasty beers. I honestly can’t tell you why there weren’t more people there – am I the only one who likes cheap craft beer and above average frozen pizza? Perhaps. But my point still stands. Through that event, Lagunitas got their name out in the community, we got to try more Lagunitas than I have even had at a beer festival and we ate plenty – it was a successful beer dinner by all definitions. So now I want more but I have seen none. Unlike a wine-pairing dinner that teaches people that the only way to enjoy good wine and good food is to pay a lot at a fancy restaurant, the beauty of the high-low beer pairing is that it is inexpensive for everyone and a great way to focus on the beer and how to pair and enjoy it with everyday foods. That’s what craft beer is all about.